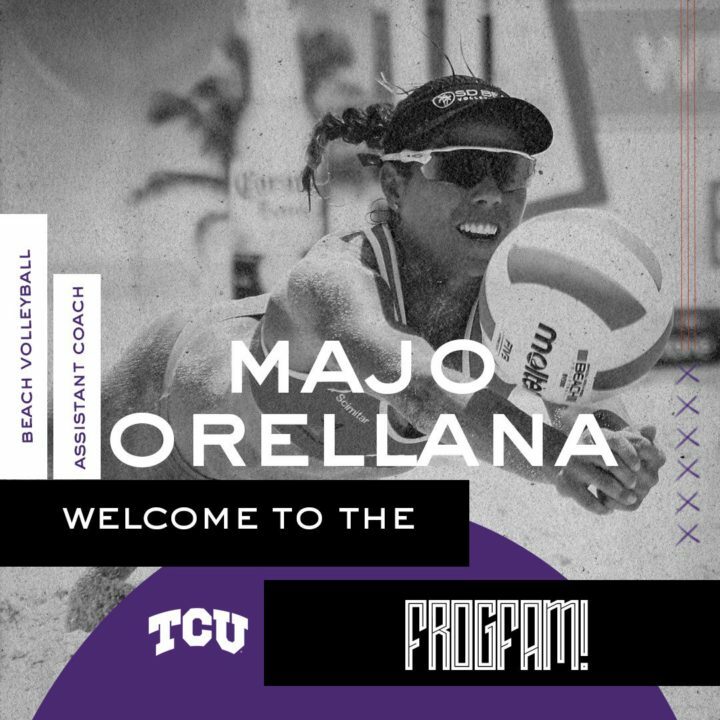 TCU, home of the only ‘Power 5’ beach program in the state of Texas and one of just 4 total programs in the country’s second-most-populous state, has announced the hiring of Maria Jose “Majo” Orellana as its new assistant coach. Orellana will be the program’s first dedicated, full-title assistant in the 5-year history of the program. She joins a staff led by head coach Hector Gutierrez and joined by new graduate assistant Kristy Wieser. Orellana’s arrival coincides with that of her younger sister Mandi Orellana, who transferred in from LSU for the 2018-2019 school year. The Orellana sisters hail from Guatemala in Central America, a country that Majo represented at the 2003 and 2007 Pan American Games on the beach; and indoors with the Guatemalan National Team at a World Championship qualifier. The two played together internationally, picking up a pair of top-6 finishes on the NORCECA beach tour in 2016. Majo, playing with Anna Ramirez, was a Guatemalan National Champion in 2009. As a coach, Majo Orellana comes from the Coast Volleyball Club in San Diego, where she was the beach director. Prior to that, she was the Executive Director of the San Diego Beach Volleyball Club. She also founded an organization called “Dig It,” which helped coach and connect Central American beach volleyball players to American collegiate programs. In 2017, the Horned Frogs finished 18-8; a year later, they were just 10-22, but that was played against a greatly-improved level of competition, with 21 of the 32 matches being played against ranked opponents. 2019 could be a breakthrough year for TCU, aided by the complete coaching staff, if they can develop as a group. Possibly the most talented team in the 4-year program of the history, besides the return of most of their contributing players from last season, the team brings in the younger Orellana, who was 8-9 for LSU last season playing mostly at the #2 line as the Tigers qualified for the NCAA tournament; and Molly Lohman, a former powerhouse middle blocker at Minnesota who was named a 2016 AVCA Honorable Mention All-American. Lohman is 6’3 and once put up 14 blocks in a 3-1 win over Michigan. TCU will join the CCSA next season, which should further boost their chances at an NCAA tournament bid.